The Middle Atlantic RIB-5-MRK-26 5-Bay Steel Riser Base is a 2.5" (63 mm) riser base that can accommodate five MRK series 26" (660mm) deep racks. This riser base allows for field rough-in prior to arrival of racks and enclosures. To facillitate cable management between racks, this riser has laser knockouts on both sides. With a lifetime warranty, this base is constructed using 11-gauge steel pre-treated with a black powder-coat finish. 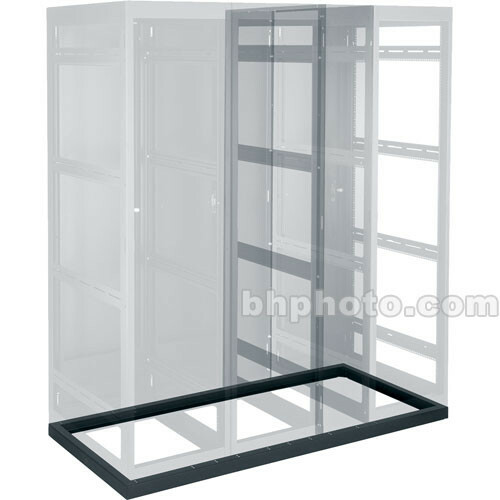 Five 26" (660 mm) deep racks (MRK series) can sit comfortably on this riser base. This riser base has laser knockouts on its both sides for convenient cable management. This riser base uses 11-gauge steel in a fully welded construction. This riser is pre-treated with a durable textured black powder-coat finish. Box Dimensions (LxWxH) 111.0 x 30.0 x 5.0"